Taking a trip to Walt Disney World in Orlando can be one of the most exciting things for a little one to do. While an older child will get more out of the trip, a younger child can also have fun and create those memories. While I normally don’t do posts like these, I do travel a lot and thought this would probably help others who will, in the future, travel to Disney World with a toddler. (This is going to be long, so bookmark it for later unless you have 5 – 10 minutes.) See below for some tips and tricks while traveling, as well as 30+ things to do with a toddler at Disney World. Before we get to the list, let’s talk about getting there. While traveling to and from your destination, make sure that you do have entertainment prepared for the littlest traveler in the group. We have a toddler who can hardly be contained in one place, so she needs a good bit of items to keep her busy. We happen to have an iPad (make sure it’s charged! ), and I have several learning games and a few Disney games downloaded. She kept herself busy for most of the flight with a Minnie Mouse puzzle game she just couldn’t put down. When traveling to Disney World with a toddler, I would also recommend keeping things simple and easy for yourself as well. If you are staying on Walt Disney World property, make sure you contact Disney and do the Magical Express. They will send you yellow bag tags for you to attach, and once you drop your luggage at your airport of departure, you won’t see them again or have to worry about them until you arrive to your resort and they deliver to your room. The other benefit is not having to take on the extra expense of a rental car (or possibly getting lost). Disney’s Magical Express will pick you up from the airport and take you to your resort on the property. Once there you can check in, head to your room, and then leave to go and discover Disney! When you return, your bags will be in your room and ready for you to unpack. I recommend this when traveling there with any group, but with a little one, this is a blessing! I am a Disney Vacation Club Member, so we have been to Disney a lot, and will be going back to Disney for quite some time. A benefit for having such a large resort like Disney World for us travelers are the small businesses that pop up. We were able to rent a stroller, have food and water, etc., all delivered to our room for the stay. They had everything delivered to our resort before we arrived, and we dropped the stroller to the Bell Services at our resort upon departure. There are many different agencies your can use, and I would call the concierge before you arrive to see who they recommend you use. Having a stroller for your entire stay, not just for the parks, is a blessing. Trust me. You will walk a ton, so get your walking shoes ready, and save yourself a tired child by having that stroller with you the entire time. 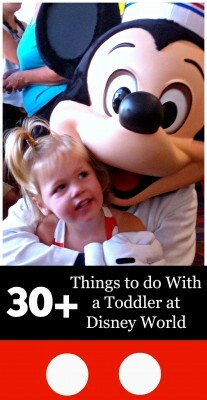 You will thank me later!Now let’s get to that long list of things to do at Disney World with your toddler. What exactly can a toddler do in the Disney World parks? A good bit actually! Remember that you can do more than 30+ things with your toddler. This is a list of what we did on our visit specific for our toddler, and I think adding any more would have been difficult on her, and also us as parents.Our first day at Magic Kingdom was eating breakfast with the Disney Princesses in the castle. Meeting Snow White over french toast and bacon is every toddler’s dream! Numerous shops, Character Shows, Character Meet and Greets, etc. We went to Magic Kingdom on two different days during our trip. It’s probably one of the best places for a toddler to be. She enjoyed meeting all of the different characters, watching all of the shows at the castle, and seeing all of the little Main Street shows along the way. We went in the mornings, left for four hours for a good afternoon nap, and then returned for dinner and fireworks. Staying in a park all day with a toddler is crazy, and would probably also drive you crazy. Make sure you add those breaks into the park visits. For Animal Kingdom we started off with a Character Breakfast at Tusker House. She is a big fan of Disney Junior, so seeing all of the characters come to her over breakfast was a treat! We left early because of a storm, and nap time. While we did not go thru every toddler area we could have, we went thru enough! One thing I want to mention are the Baby Stations that Disney has all around their parks. Make sure you always grab your maps upon entering the park and scoping those out. With a baby or toddler you will want to have this location circled! Hollywood Studios was a fun place to visit as well. If you have a Disney Junior fan in the house, this is the place to be! There are a few additional shows and tons more to do. This was just enough for our quick little trip with our little one. Probably one of the coolest fireworks shows second behind the Magic Kingdom fireworks over the castle. It really is neat, and it will keep the little one mesmerized! Epcot has a ton of places to visit in the World Showcase that can keep you busy for a long time. While we did not get a chance to see them all, I know we will be coming back later with all of the kiddos, and a non-toddler! We spent our last day back at Magic Kingdom. Before we went we had one last character breakfast lined up at Chef Mickey’s over at the Contemporary Resort. The ride to the resort on the tram was fun for the little one, and saying hello and goodbye one last time to all of her favorite characters was a blast. Upon leaving you can drop your bags at the resort bell services, receive your plane tickets, and check in to your flight. They really do try and make things as easy as possible for any traveler, and I suggest using these services when traveling with a little one. It helps keep a little sanity! Then all you have to do is hop back on to the Magical Express and enjoy your ride back to the airport. Once you arrive, just head straight over to security. Ahhh….time savers!!! Love this. I hope you found this list helpful! Remember, it is by no means an entirety of things to do in Disney World, but it is a great start for traveling with your toddler. I imagine in a couple of years I will be writing “2000+ things you can do with your 4 kids at Disney World”. Until then, it’s a slow and steady pace, absorbing some very unique and fun things to do. What are some of the things you like to do with your toddler at Disney World, or traveling in general?